Room 419, 800 Third Street, NE, Washington, DC. Sthreshley exhibited, an installation of Concrete Voids. Objects made from casting concrete into discarded bubble packaging of household products. Donations are accepted and will be used to build a maternity hospital in Kinshasa, Congo. 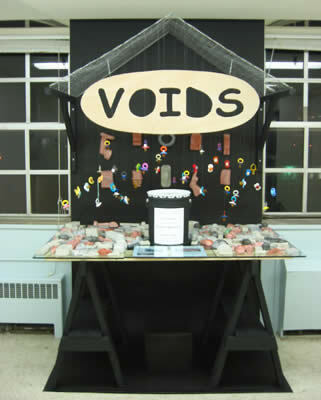 Concrete Voids and donation bucket, on a glass table supported by sawhorses. Pacifiers suspended by monofilament from wire grid supported by wooden brackets. Tarpaper background and floor. Plywood sign. 100" x 66" x 43"